Water, water everywhere! But what’s fit to drink? One might think that the #1 selling water filter removes a lot of contaminants. You might also think that the most expensive water filter is the best. And you might think that a fancy system like reverse osmosis would remove more things than a simple pitcher filter. Unfortunately, if you thought any of those things, you were wrong. I thought that trusted names like Culligan and Shaklee would have great products, but I was wrong about that too! Regardless of whether you have municipal water, well water, or bottled water, there are contaminants in it that are potentially dangerous. All of them contain toxic substances and various types of endocrine disruptors, which do all sorts of bad things to our bodies. If you have city water, you want to eliminate the chlorine and fluoride from the water. Well water can contain heavy metals and pesticides, such as atrazine and 2,4-D. Bottled water contains bisphenol-A (BPA) and phthalates, and because it has much looser regulations than municipal water supplies, it could also contain a host of other contaminants. In fact, bottled water is often much worse for you than either well water or city water. Why should I care if those things are in my drinking water? The endocrine system is responsible for hormone regulation in your body, from estrogen and progesterone to thyroid hormones. In addition to turning male frogs into females, atrazine has also been linked to breast and prostate cancer. BPA has been linked to multiple cancers, reproductive problems, obesity, diabetes, early puberty, and heart disease. Phthalates have been linked to infertility in men, thyroid disease, obesity, and diabetes. Although a lot of lead will kill you, a little lead can cause miscarriages, high blood pressure, diabetes, and more. For more information on other endocrine disruptors in our lives, check out the Environmental Working Group’s Dirty Dozen List of Endocrine Disruptors. So, how do you know which water filter to buy? Although some people are under the impression that a “purifier” is better than a “filter,” there is no legal definition for those words. If you search online, you will find that some people attempt to define them, but what is defined as a “filter” on one site is defined as a “purifier” on another site. The bottom line is that you need to know what needs to be removed from your water. Unfortunately, there is not one single technology that does everything. Although some people think that a reverse osmosis system is the gold standard for water treatment, some of those systems don’t remove pesticides. Those that do remove pesticides will have a second stage of filtration that uses some type of carbon filter. To learn more about the different types of filter technologies and what they can and cannot do, check out this article. But it’s important to understand that not all carbon filters are created equally. Just because a filter can be made to remove a certain contaminant does not mean that all filters actually do remove that contaminant. 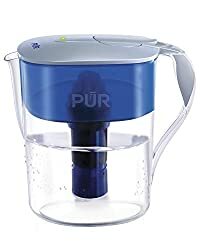 To learn how various water filters compare, check out the Environmental Working Group’s Buying Guide, which tells you which filters are certified to remove what contaminants. You can search the database by type of filter (pitcher, under stink, etc), filter technology (reverse osmosis, carbon block, etc), and contaminants that are removed.